The building of an iPS cell stock for regenerative medicine involves the collection of cells from healthy donors with homozygous HLA (human leukocyte antigen). The aim of the stock is to hold iPS cells of guaranteed quality which can be supplied quickly to medical care institutions and research institutions in Japan and overseas when required. 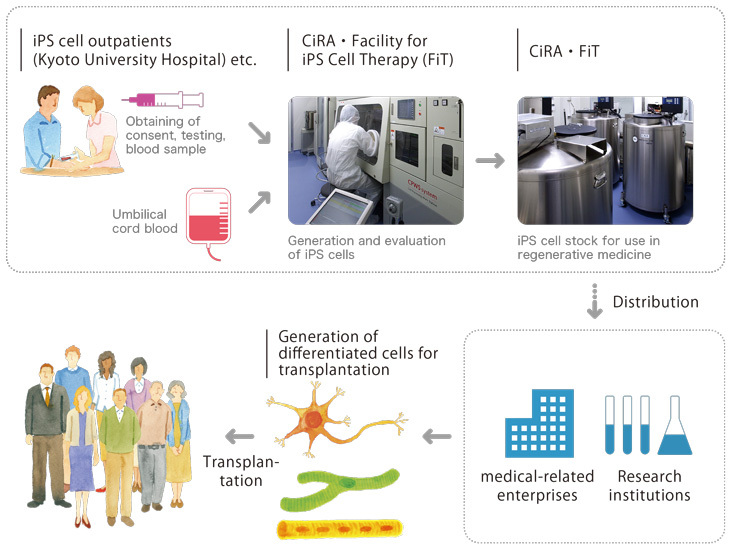 The project is being led by the Medical Application Promoting Office, which is part of the CiRA Research Support Division, in collaboration with Facility for iPS Cell Therapy (FiT), a CiRA cell-processing facility. Full-scale operation began in FY2013 with the aim of establishing an iPS cell stock that covers 30-50% of the Japanese population by the end of FY2017 and most of the population by the end of FY2022. In 2015, iPS cell lines generated at FiT were available to several research institutions for further assessment. The ultimate goal is to supply iPS cells of good quality at large scale.